The Ojai Valley in those days was a popular winter resort for wealthy eastern people who would come out for the winter. Other than playing tennis and cards, about the only entertainment was horseback riding, and for the elder people, a team and surrey with a driver would trot them about the valley, up Matilija Canyon (the road ended at Wheeler’s Hot Springs) up through the Upper Ojai valley and onto Sulphur mountain, or over to Shepherds Inn via Casitas Pass and sometimes on to Santa Barbara. 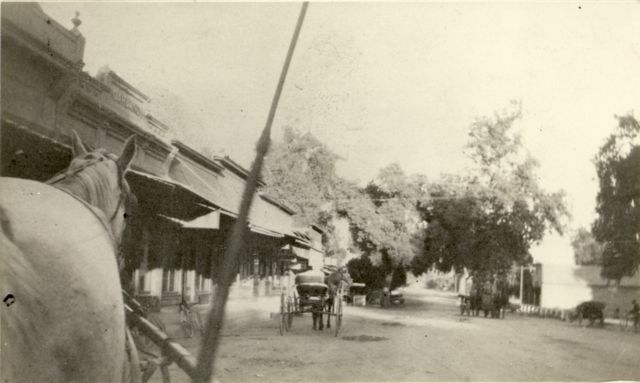 Shepherd’s Inn, situated on the line between Santa Barbara and Ventura County was a popular, rustic inn frequented by both Santa Barbara and Ojai tourists. The Casitas Pass was approached only via what is now Foster Park, and the road followed along the foot of the north side of Red mountain. But the east and west passes were virtually the same as of today. One popular ride was to follow the beach from the Rincon to Ventura when the tide was low. I believe it was sometimes done with team and wagon. I did it only on saddle horse. The livery stable was not only the site of horse trading and training, but also some lively prize fights were held there, sometimes right out on the street and sometimes in the stable. When held inside buggies would be crammed into a corner to make room for the spectators. Some of the younger fry had their first lessons in boxing there. I well remember one time when the men had Mayor Smith and me matched together. We were fairly evenly matched and things were going smoothly until Mayor glanced over his shoulder to see how near he was to a horse’s heels in a nearby stall. At that instant I uncorked a left to Mayor’s jaw. Mayor considered that unfair tactics and retaliated with all he had. The riot was quelled by Sam (Mayor’s father) dragging him across the street to their home back of the post office. One smart alec rode into Clyde Stewart’s grocery store and roped a fellow and dragged him over the counter. But that episode is getting into the second decade and I am trying to confine myself to the first decade. And besides, that smart alec (notice I don’t use the term hoodlum) was myself. One November night the village stillness was suddenly shattered by a series of pistol shots accompanied by unearthly yells. It turned out to be only Johnny Joshlin celebrating the beginning of the fall rains. After emptying two six-shooters, he returned to Lagomarsino’s saloon and all was quiet again. Now I wonder how Johnny happed to have two six-shooters, for he was not a gunman. The only law enforcement officer the valley had was constable Andy Van Curren. He was a familiar sight with his flowing gray beard, riding about the valley on an iron gray horse. Another time Constable Van Curren called at his home to make an arrest. His mother met Van Curren at the front door and parlayed with him while the intended arrestee skipped out the kitchen door, saddled and mounted a horse, and rode off to the Upper Ojai.